A collection of fun stuff related to the piano! Virtual Online Piano You can Play! Fun Facts About the Piano! Christie’s Auction House once sold a Victorian Steinway grand piano for $1.2 MILLION DOLLARS! The piano was sold to the Sterling and Francine Clark Art Institute of Williamstown, Massachusetts. What famous piano company was Engelhard Steinweg the founder of? Maybe this will help. In 1853 he Americanized his name to Henry E. Steinway! That the piano is known as “The King of Instruments”? The piano earned this title for a number of reasons including it’s tonal range ( the piano covers the full spectrum of any instrument in the orchestra from below the lowest note of the double bassoon to above the top note of the piccolo), it’s ability to produce melody and accompaniment at the same time (try that on a flute) and it’s broad dynamic range. It is also the largest musical instrument (excluding the pipe organ), most versatile and one of the most interesting. with the combined pull of all strings equaling approximately eighteen tons ! That a boxed model D Steinway Grand Piano weighs 1400 Pounds ! The working section of the piano is called the action. There are about 7500 parts here, all playing a role in sending the hammers against the strings when keys are struck. The name piano is an abbreviation of Cristofori’s original name for the instrument: piano et forte or soft and loud. During 1869 the US produced 25,000 pianos valued at $7,000,000, during 1910 production was 350,000 pianos valued at $100,000,000 ! The term “Tickle the Ivorys” refers to playing the ivory keys of the piano, however, ivory has not been used to make piano keys since about the 1950’s (they are plastic, sometimes referred to as “Ivorine”). That there are currently over 50 Brand Names of pianos? Don’t forget to visit PianoSuppies.com for piano lamps, bench cushions, tuning equipment and more ! 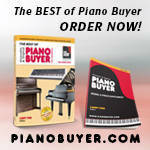 Or the Piano Book Store for great books about pianos . Independent studies show that children who learn piano tend to do better in school. This is attributed to the discipline, eye-hand coordination, social skills building, learning a new language (music) and the pleasure derived from making your own music. It should also be noted here that anyone considering a career in any facet of music should consider studying the piano . Many music schools require at least one semester of piano, regardless of your major. Over the years there have been many attempts at “improving” the piano. One such experiment was to replace some of the wooden action parts with plastic. Some pianos from the 1940’s, 1950’s, and some in the 1960’s used plastic parts, but they cracked with age. (If you own one of these pianos, you might want to check out Piano Tuners to get it repaired or even Piano Dealers to replace it, or look for the replacement parts in our online store www.PianoSupplies.com).Improvements in plastic in later years eliminated this issue.There were many other ideas that tried and failed including the Jensen piano which had 2 keyboards, a vertical grand, one that had a keyboard that was more like a typewriter and many others. 2nd President – John Adams – Currier & Co.
6th President – John Quincy Adams – Currier & Co.
21st President – Chester A. Arthur – Piano cannot be located. 41st President – George Bush – Did not own personal piano. 42nd President – William (Bill) Clinton – Baldwin Grand in the Governor’s Mansion. 44th President – Barack H. Obama 2009-2017, Steinway Grand Piano moved from their Chicago hom to the private living quarters in The White House. Jonas Chickering was the first exporter of American made pianos. First shipment to India 1844. Yamaha, established in 1887 was the first piano manufacturer in Japan. That pianos were the first meaningful brand names, the first Status Symbol, and the first major items sold on an installment basis, which was the cornerstone of several major banking institutions of today. A grand piano action is faster than a vertical (spinet, console, upright) because it has a repetition lever. This allows the pianist to repeat the note when it is only half way up. A vertical action requires letting the key all the way up to reset the hammer action. The worlds largest piano is a Challen Concert Grand. This piano is 11 feet long, has a total string tension of over 30 tons and weighs more than a ton !! The term A-440 concert pitch refers to A above middle C vibrating at 440 cycles per second. The first note (on a standard 88 note keyboard) is A . The exact middle of the keyboard is not middle C, it is actually the space between E and F above “middle” C.
The last note of the keyboard is C.
The Bösendorfer Imperial concert grand piano is 9′ 6″ long and has 9 extra keys stretching to a growling C below bottom C ! (The Imperial grand sold for $55,000 in 1980!) The 9′ and 7′ 4″ grands have four extra bass keys, the lowest of which is F below bottom C.
Comma (or coma) — A minute interval or difference in the pitches of the same musical tone occasioned by different systems of tuning. The comma of Didymus is an interval such as that between two enharmonically equivalent notes like B-sharp and C-natural, an amount of 24 cents. (cents are 1/100th of a semitone) The syntonic comma is the interval between a just major third (5:4) and a Pythagorean third (81:84). The comma of Pythagoras (known also as the ditonic comma) is the difference between a cycle of just fifths and seven perfect octaves. In equal temperament tuning this comma is absorbed by the diminishing of each successive fifth in the cycle by the amount of 1/12th of the comma. Paul Janko, Austria, constructed a keyboard of six tiers, one above the other — runs and arpeggios made less difficult than on regular piano keyboard. Silver, glass, gold and silk were used in making strings for musical instruments. Zumpe created the square piano in England in 1760. Beethoven’s Studio Piano is in the National Museum, Vienna, Austria. The first patent issued to H. Steinway, New York, was May 5, 1857. Gustavus Hessilens made a spinet piano in Philadelphia in 1742. G. Hoffman built a symmetrically rounded piano in 1804. M. Welte and Son of Freiburg, Germany and Ludwig Hupfeld introduced the reproducing pianos about 1904. Sebastian Erard made the first French Square piano in 1777 and the first grand in 1796. John Broadwood enlarged the strings in the square piano, used two thick strings instead of three thinner ones and moved the wrest plank from the right side to the bottom of the case in 1788. Johann Christian Schleip built many vertical pianos known as the “Giraffe Piano”. Johann Behrent built the first piano in America at Philadelphia in 1775 under the name “Piano Forte”. Mangeot of Paris built a piano with reversible keyboards in 1876. Sebastian Erard built a piano and organ combined for Marie Antoinette. Piano Row was located on 14th Street, New York. This was the headquarters of such fine pianos as Steinway, Steck, Behning, Bradbury, Sohmer and many others. As far back as 1901, Estey stated they had manufactured and sold 325,000 organs. Nickelodeon is a general term used to describe various electrical coin operated pianos. The first census giving figures for instrument makers was in 1860 which was 223 – about 110 were piano manufacturers. About 1870 Daniel F. Beatty advertised rosewood square grands for $255. Piano player was developed 1863 with push up cabinet, with wooden felt covered fingers that depressed keys. R.W. Pain was probably the first to build a pneumatic self playing piano, a 39 note self contained player for Needham & Sons in 1880. J.C. Stoddard, Worcester, Massachusetts, invented the Calliope in 1855. A drop of 1/2 step in pitch can equal a change of 3000 to 5000 Pounds of tension! (Now you know why it is important to keep your piano tuned). How did the modern keyboard evolve? See this page. The YamahaTM piano company produces a new piano that sells for $333,000! more on this. Pianists have more efficient brains! more on this. Like to know how a piano is made? 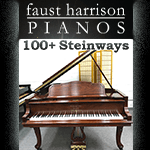 See How a Piano Is Made … How a Mason & Hamlin grand piano is built. If you would like to contribute to Fun Facts, please send us a note. 1 Pings/Trackbacks for "Fun Stuff"